In this project, two batch evaporators were automated to enable the production of more consistent crystals and a more consistent product concentration. The project involved measuring the evaporator charge volume and water vapour draw off. Understanding the feed concentration enabled logic control to produce consistent product concentration. 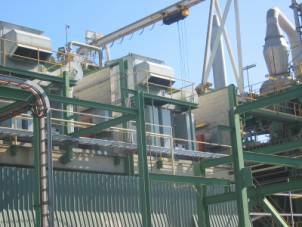 This project significantly improved the plant’s slurry output and reduced operational labour. This project involved the automation of a high temperature (350 oC) coke particle dropout system from a high temperature (1550 oC) fluidised bed reactor. A previously manual system was automated to yield more consistent operation and a more constant effect on the fluidised bed reactor.